This recipe appeared last week in the Washington Post Food Section. 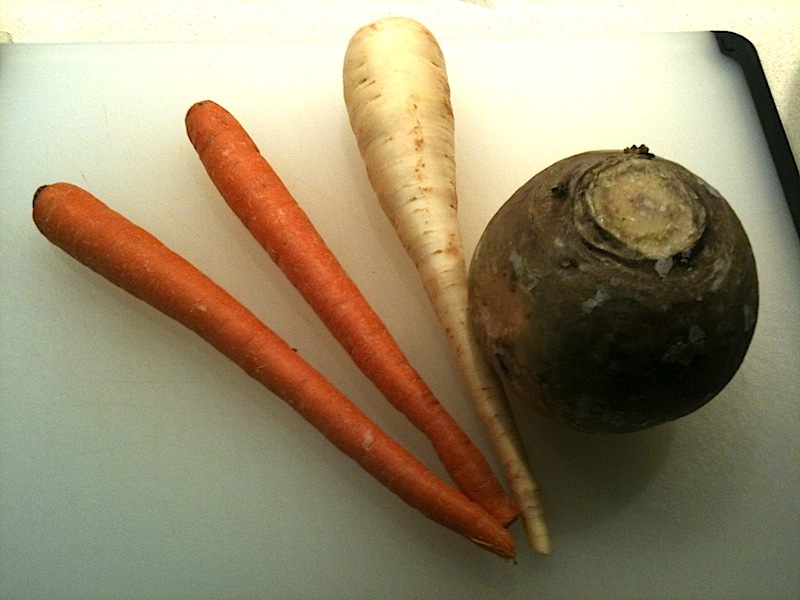 I was attracted by the combination of vegetables: parsnips, rutabaga, carrot, onion and Brussels sprouts. Sounds awesome! This was my first experience with orzo, a pasta shaped like a grain of rice. Normally when I make pasta, I use a full 16 oz. package, but I'm glad I only used the 8 oz. called for in the recipe. 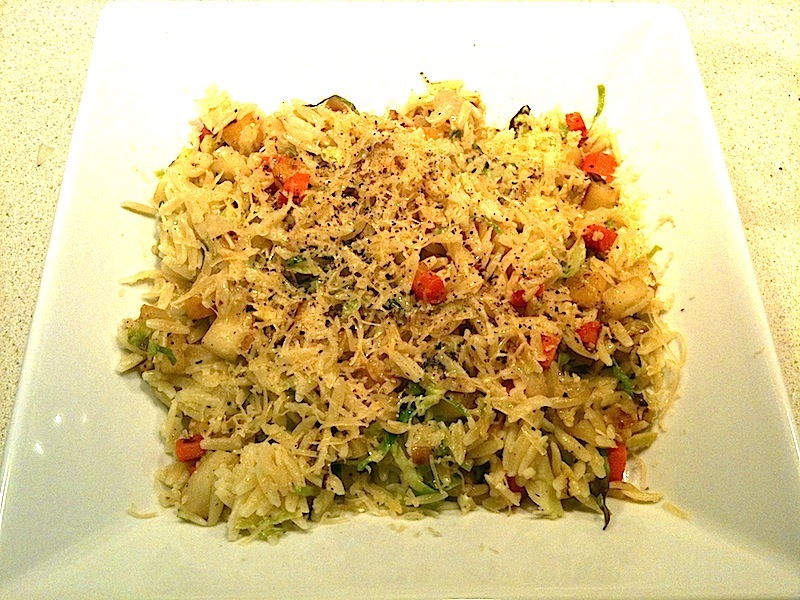 Orzo's shape makes it denser, and I thought the proportion of pasta to vegetables was just right. I was concerned that cooking the root vegetables on the stove wouldn't soften them enough, and issue I raised with the Food Section staff, but writer Stephanie Sedgwick assured me it would be fine and she was right. The vegetables were nicely tender, although I erred on the side of making them smaller--about 1/4-inch dice--to ensure they would cook through. Here's a make-ahead tip for this recipe: prep the root vegetables first. As with all recipes, you should read through the whole thing before you start so you know what to anticipate and think about which steps might require extra time. I don't necessarily prep all my ingredients in advance--there are many things I can accomplish in the time it takes to complete a step, like mincing garlic or measuring liquids. 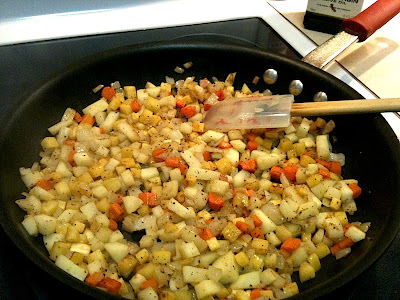 But since this recipe calls for three types of root vegetables that need to be washed, peeled and carefully diced, I recommend doing that first before heating up the olive oil to sauté the onion in the first step. While the onion and root vegetables are cooking, you should have enough time to cut up the apple and prep the Brussels sprouts. I enjoyed this dish and the sweetness of the vegetables really came through. But if I made it again, I would make two changes: I would add bacon. Vegetarians may groan at this, but I think the flavor would pair nicely with the ingredients and add another interesting element. It was also rather dry, as there's no liquid, so I might try to make it a little saucier, perhaps by adding some chicken stock and a little more olive oil near the end. I liked this dish and would have been completely satisfied with it, but now that I know bacon is an option, I feel cheated. I want a do over. Maybe we could try it again in a few weeks.